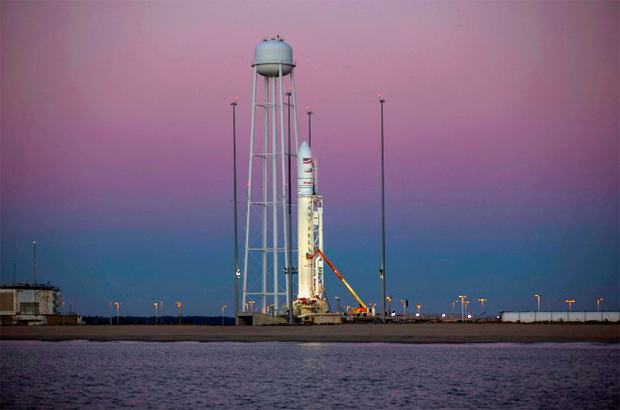 Launch of an Orbital Sciences Antares rocket carrying a commercial cargo ship bound for the International Space Station was scrubbed Monday evening after a sailboat strayed into the off shore danger zone southeast of the Virginia launch site. Liftoff from the Mid-Atlantic Regional Spaceport at NASA's Wallops Island, Va., flight facility was targeted for 6:45 p.m. EDT (GMT-4), roughly the moment Earth's rotation carried pad 0A into the plane of the space station's orbit. But as the countdown ticked into its final minutes, range safety officers noticed a boat in the zone where rocket debris could fall in the event of a launch failure. The countdown was held up at the T-minus 12-minute mark and then restarted in hopes the ship would clear the area by the end of the rocket's 10-minute launch window. But it was not to be, and mission managers reluctantly called off the countdown for the day as the window expired. Engineers were told to recycle the rocket for a second launch attempt at 6:22 p.m. Tuesday. Forecasters predicted good weather. If all goes well, the Orbital Sciences Cygnus cargo ship perched atop the Antares will catch up with the space station Nov. 2, pulling up to within about 30 feet of the lab complex. At that point, astronaut Reid Wiseman, operating the lab's robot arm, will lock onto a grapple fixture so the capsule can be pulled in for berthing at the Earth-facing port of the forward Harmony module. "This mission is going to carry over 5,000 pounds of cargo to the crew, a wide variety of items, everything from science to clothes to food, tools, replacement parts, etc.," said Orbital Executive Vice President Frank Culbertson, a former shuttle commander and space station crew member. The mission is Orbital's third operational space station resupply flight -- the fourth including a demonstration mission -- under a $1.9 billion contract with NASA that calls for delivery of some 44,000 pounds of hardware and equipment to the space station. SpaceX holds a similar $1.6 billion contract to covering 12 resupply missions.